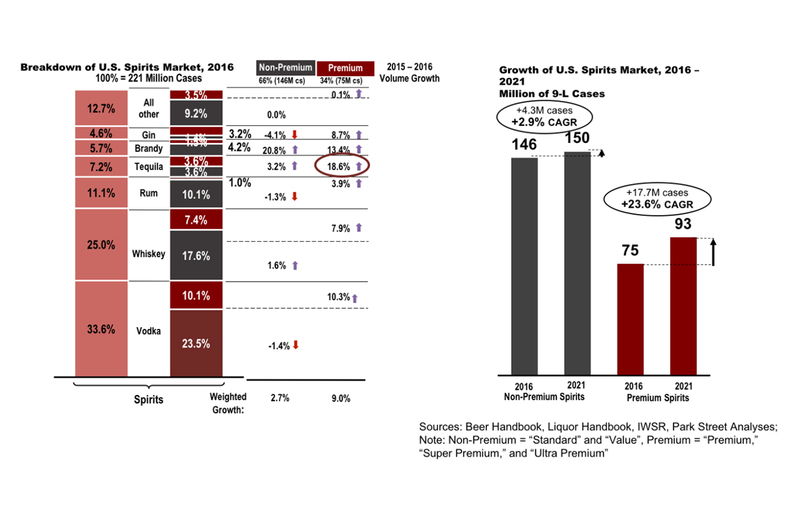 The volume of the U.S. beverage market totals at 202 billion liters of liquid. Alcohol is responsible for 16.5% of total beverage volume. The alcoholic beverage market is over 80% attributed to malt beverages with wine and spirits products splitting the remaining 20%. Distilled spirits make up around 7% of the sales of alcoholic beverages. 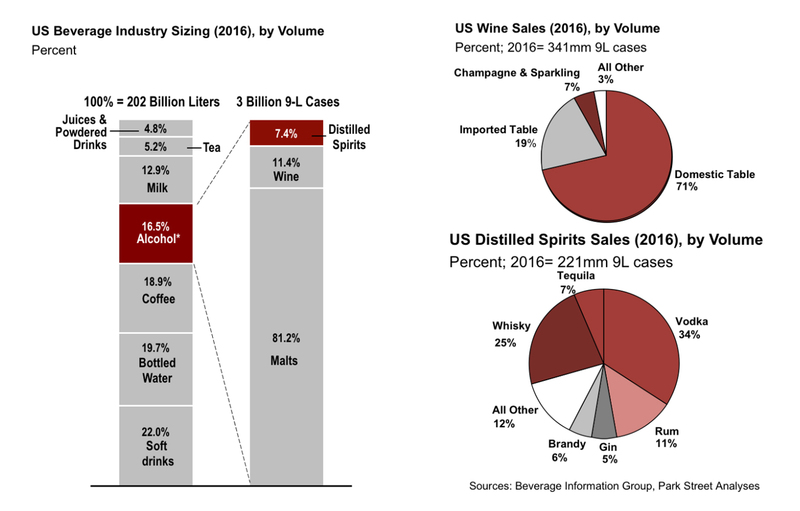 The largest sub-category of spirits is vodka with 34% of cases sold, followed by whiskey with 24% and miscellaneous specialty spirits at 12%. Wines make up around 11% of the alcoholic beverage market. 71% of the cases sold are domestically produced wines and 19% are imported wines. Champagnes and sparkling wines make up around 7% of the wine volume. 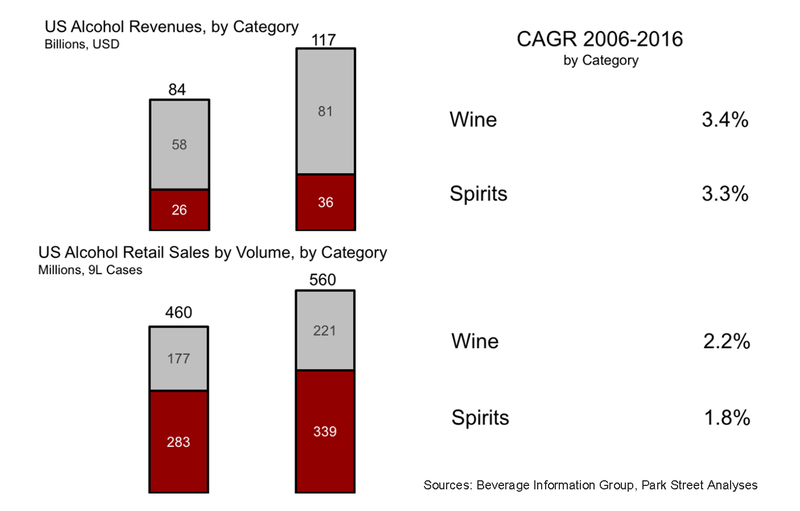 The wine and spirits industry has experienced steady growth over the last ten years. 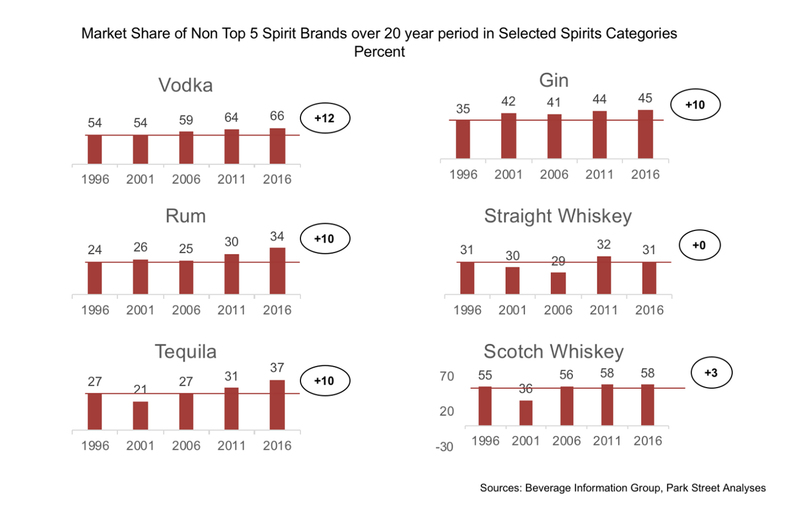 The spirits segment volume has been growing at a CAGR of 1.8% over the last 10 years while revenues outpace this growth with a CAGR of 3.3%. 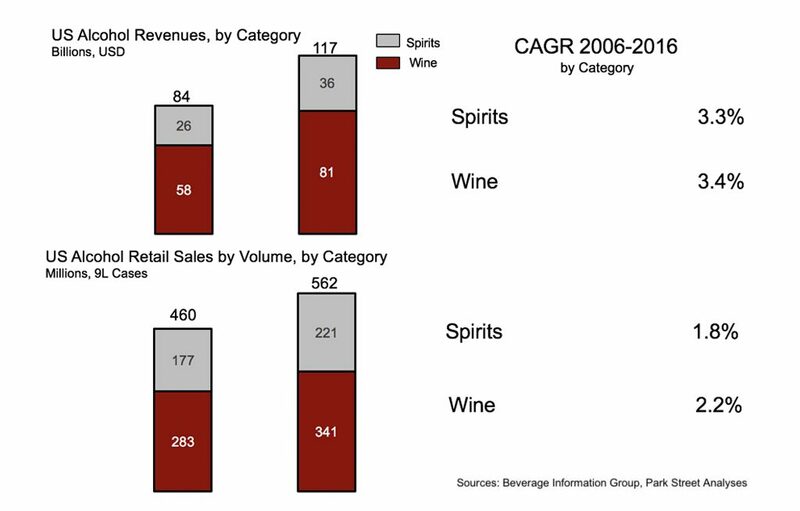 The wine segment has been growing steadily at a CAGR of 3.4% over the last ten years in revenues and a CAGR of 2.2% in volume. 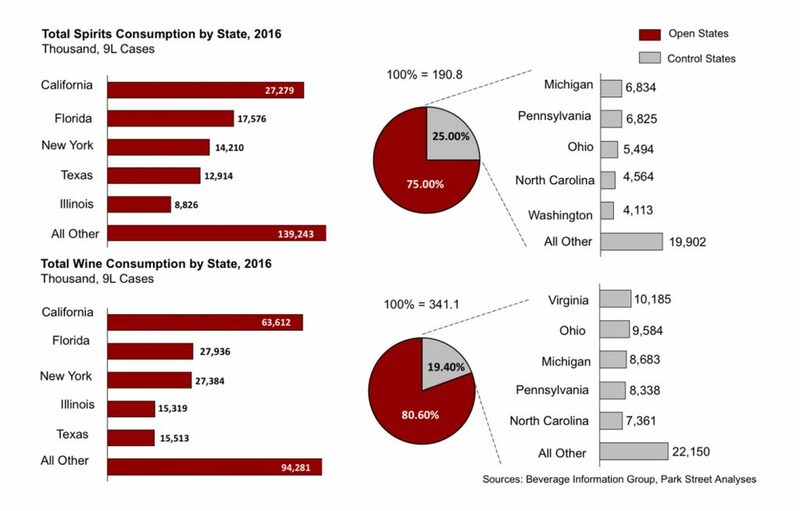 Open States are approximately 80% of the wine and 75% for spirits, the remainder are sold into control/monopoly states. The largest markets are California, Florida and New York. 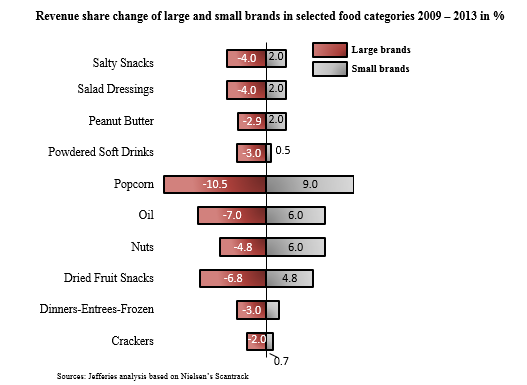 Smaller brands taking share of larger brands is a phenomenon across many FMCG (fast moving consumer goods) categories. Factors often cited as reasons include: shortening life cycles of brands in general, entrepreneurial innovation wave, liberalization and de-concentration of marketing avenues (e.g., Internet), premiumization, desire of consumers to differentiate themselves. Smaller brands have been gaining share. The non-top 5 brands gained up to 12 percentage points over a 20 year period and up to 6 percentage points in the last 5 years. From 2015 to 2016, premium brands grew more than twice as much as non-premium brands in almost every category. Overall growth for premium products was 9%. Five year projections reflect estimated market share growth for premium products to reach 23.6% compared to 2.9% for non-premium. Find out why Park Street is a leading distributor and solution in the wine & spirits industry. Contact us to find out exactly what we can do for your brand.